October is designated Tyre Safety Month and with a spike in claims for blow-outs recently we’re turning our attention to the importance of checking your tyre pressure. 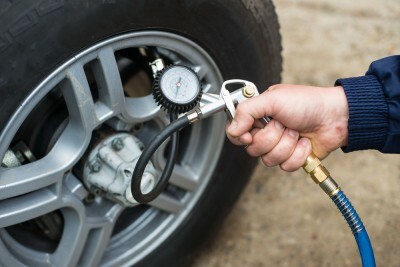 In a recent poll most of you have already told us that you regularly check tyre pressures on your caravan or motorhome before you hit the road. But this year’s TyreSafe campaign is highlighting the importance of checking your tyre’s air pressures, condition, and tread depth MONTHLY. Many factors are involved with safe towing; the correct caravan and car match, weight distribution within the caravan, wheel balancing, the quality of the tyres and tyre pressures. A correctly inflated tyre wears its tread evenly whilst low tyre pressure reduces grip on the road, reduces the ability to corner safely, increases braking distance and increases fuel consumption. Tread depth also has a significant influence on the way your vehicle accelerates, brakes and corners. There are just as many safety factors to consider when touring in your motorhome. Loading your motorhome within safe weight limits is as vital as correct tyre maintenance. In one month alone, the Caravan Guard Claims Liaison Team dealt with 10 road accident claims – all of which were due to tyre blow-outs. 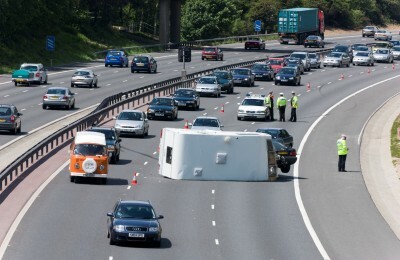 There were six accidents involving touring caravans and four road involving motorhomes, many on the motorway. In most incidents, the blow-out causes damage to the underside of the caravan or motorhome and will cost hundreds of pounds to repair. But, in more serious cases you can lose control of your caravan or motorhome, causing it to overturn – with more serious road safety implications as well as significant damage to your caravan or motorhome, internally and externally. In the vast majority of cases, a blow-out is caused by an earlier incident like a simple puncture from a nail or a screw, causing the tyre to deflate. The increased friction on the road causes the tyre temperature to rise, the tyre wall weakens and the outcome is the dreaded blow-out which can lead to loss of control of the vehicle. As well as carrying out regular safety checks on your whole outfit’s tyres, it’s also worth while investing in a tyre pressure monitoring system (TPMS) for your caravan or motorhome to keep those dreaded accidents to a minimum. A TPMS continually checks both pressure and temperature of your tyres while you are driving and gives you an alert if things aren’t right. It’s such a valuable safety aid that all new cars in Europe must now be fitted with a TPMS. 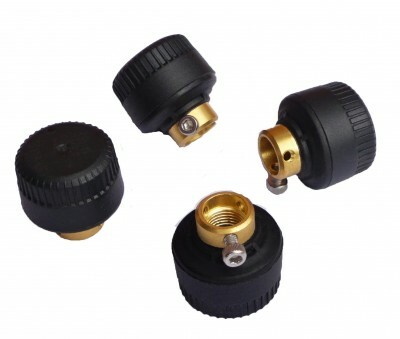 You can get retrofit systems for caravans or motorhomes and, if your towcar is already equipped with a TPMS, you can get a kit just for your trailer. Choose a reliable brand approved by your insurer and with support for replacement sensors. Decide how many tyres to monitor – now and in the future. Make sure the system monitors both pressure and temperature and that you can set pressure alert levels separately for the car and trailer. If you’re a caravanner, think about what happens when you aren’t towing. On some systems, you just press a button to stop monitoring the trailer. For large motorhomes or long towing outfits, check if a signal booster is available to extend the transmission range from the sensors. Sensors on each tyre continuously measure the pressure and temperature of the tyres and transmit the information wirelessly to a monitor that displays information and sounds an alarm if there is any abnormality. What TyrePal systems are out there? TB99 – Suitable for cars, caravans, motorhomes and any vehicle with up to four wheels (you can monitor thespare tyre by adding an extra sensor, sold separately). TC215B – Suitable for cars, caravans and motorhomes. TPMS Ready – Monitor kit for TyrePal TPMS-ready caravans and trailers (i.e.those which already come equipped with factory fitted internal sensors such as the 2015 Bailey Unicorn). 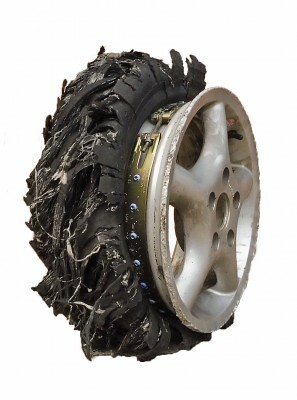 For more information visit www.tyrepal.co.uk or speak to a specialist tyre company. A TPMS is also available from supplier Snooper. TyrePal will give our readers FREE DELIVERY when you use the promo code CG1510 at the checkout on orders over £75. Offer ends 30th December 2015. (Delivery may be delayed over the Christmas period). That’s good to hear Jeff. Thanks for sharing. Good article, but it doesn’t explain what to do with motorhomes when the converter recommends a different tyre pressure to that recommended by the tyre manufacturer. Thanks for the feedback Tony. The correct inflation pressure of your motorhome tyres should be shown in the vehicle/chassis handbook. Picked up (New to us ) Motorhome and made the journey from Wiltshire to Dover. Both Brand new rear tyres were over inflated thus causing blow out.There was also a fault in the beading of the tyre that blew. On examination the two front tyres were out of date and showing signs of radial cracking. Now got 4 nice new tyres, but it goes to show that even if the tread looks good all may not be. Over 6 years is not good and tyres should be replaced regardless of good tread etc’be good with the rest of the tyre.CHECK THE DATES!! and keep to manufactures pressures. Thanks for sharing your experience and advice with us Chris. Had a blow out on my trailer in the Early morning bad weather not good. Had recover but i sill lost best part of a day’s holiday. An offside rear tyre blew out on my autocruise motorhome on the M6 south of Kendal last week! Greenflag came out and changed the spare! The fitters that fitted the new tyres said that the blow out was 10 years old and the spare was 12 years old!! Is it a legal requirement to change tyres when they are 4 years old? No it’s not a legal requirement per se – it’s just a recommendation that tyres be replaced when they reach five year’s old due to deterioration and it’s not recommended to use tyres which are more than seven year’s old. Legal requirements relate to tread depth, and driving with damaged or worn tyres could run the risk of a fixed penalty notice. As far as insurance goes, there is a general policy condition to take reasonable steps to safeguard your caravan against damage – this includes maintaining the caravan in a sound and roadworthy condition to prevent and minimise any claims. So it makes sense to always maintain your tyres. I tried a cheap monitor which replaces the valve dust cap with a colour coded indicator which supposedly shows if the pressure has gone down. In fact these things leaked air out of the tyre which I only noticed on the morning we were leaving for a holiday. thanks for the tips on tyre pressures, can you advise on measures regarding winter storage of wheels and winter wheel plates ? i would like to take the wheels off my caravan for the winter and store the wheels in my garage until next season. Hi Keith. It’s a good idea to consider replacing your caravan’s existing wheels with ‘winter wheels’ as they save your tyres from unnecessary and uneven wear. We also accept these in lieu of a wheel clamp whilst your caravan is in storage. However, it’s a good idea to store your caravan wheels away from you caravan in a locked building to prevent thieves finding them. To prevent damage to your wheels when in storage, try not to stack the tyres on top of each other for long periods, and try not to stack other items on top of the tyres. If possible store away from direct sunlight. Another simple way to avoid tyre problems is to move the caravan slightly every now and again during winter in order to reduce pressure on any one part of the tyre. Make sure tyres are inflated to the correct pressure at the beginning of winter and check them before towing again.